In case after case, the Court is expanding the power of corporations and the very wealthy while making it harder for ordinary citizens to fight back. The big media talk a lot about stalemate in Congress, but they are missing the real story. 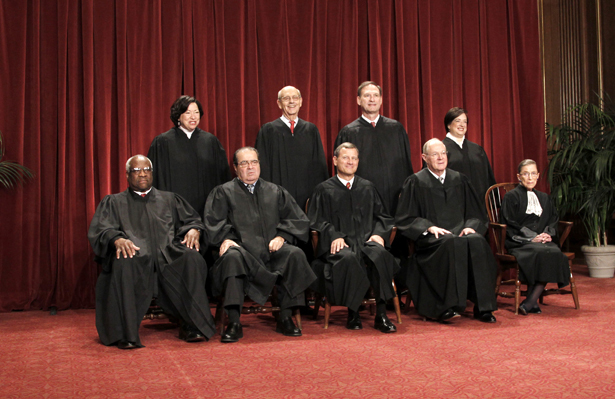 While representative democracy is dysfunctional, the Supreme Court has taken over with its own reactionary power grab. In case after case, the court’s right-wing majority is making its own law—expanding the power of corporations and the very wealthy, while making it harder for ordinary citizens to fight back. Worst of all, the Roberts Court is trying to permanently inhibit the federal government’s ability to help people cope with the country’s vast social and economic disorders. This is not a theoretical complaint. Led by Chief Justice John Roberts, the conservative Republican Court is building a barbed wire fence around the federal government—creating constitutional obstacles to progressive legislation in ways that resemble the Supreme Court’s notorious Lochner decision of 1905. That case held that property rights prevail over people and the common good. For more than thirty years, the conservative Justices used that twisted precedent to invalidate more than 200 state and federal laws on major social and economic concerns like child labor, the minimum wage, bank regulation and union organizing. New Deal reformers were stymied by Lochner at first, and they only managed to overturn it in 1937 and only then when FDR mobilized a take-no-prisoners campaign to reform the Supreme Court by weakening its unaccountable power. The Roberts Court has so far produced a slew of precedent-smashing decisions designed to hobble left-liberal reform movements before they can gain political traction. Citizens United opened the floodgates for corporate money; McCutcheon scrapped the dollar limits on fat-cat donors. Roberts gutted the Voting Rights Act of 1965, implicitly endorsing the GOP’s crude campaign to block racial minorities from voting. The US Chamber of Commerce and Business Roundtable have won numerous victories, large and small, expanding the rights of their corporate sponsors. Anxious Democrats applauded Roberts when he upheld the constitutionality of Obamacare, but many realized after-the-fact that Roberts rejected the Commerce Clause of the Constitution as the standard basis for justifying federal interventions on social and economic problems. This means the Supreme Court now has a five-vote majority in favor of shrinking federal authority. In effect, the Roberts Court was mimicking the narrow logic of the Lochner court 100 year before. The words and reasoning are there, just waiting for the right case to apply them. Magarian sees a reactionary perspective motivating Roberts and his brethren. The Justices are trying to thwart a future of renewed activism and social rebellion, Magarian suspects, because they were rattled by political unrest they saw in their youth. In the absence of aggressive political resistance, there is nothing to prevent this right-wing power grab from succeeding. But corporations are vulnerable in numerous ways that timid Democrats have not exploited. To stop the Roberts Court, the other side must get serious and begin to attack corporate power and air grievances that the public fully shares. The corporation, after all, is not a “person” who possesses “inalienable rights.” The corporation is a legal artifice created by the government and given special protections and privileges. When the Supreme Court treats corporations as though they are living, breathing creatures who have constitutional rights just like human beings, they are embracing the fundamental contradiction in the nature of the corporation. Sometimes, they want to be people. Other times, they want to be treated better than people—that is, legally shielded from the consequences of their actions. Companies and their owners want to have it both ways. The Roberts Court is helping them do so. The Hobby Lobby case now before the Supreme Court illustrates this contradiction. On one hand, the company’s conservative owners claim their religious rights under the First Amendment are violated when the federal government insists they include birth control coverage in their healthcare plans. If Roberts buys that argument, any employer can dream up religious values that exempt it for almost any regulatory law they choose. On the other hand, the Hobby Lobby owners are not about to surrender their own “limited liability” protection from lawsuits against the company or criminal liability for the company’s violations of law or its failure to pay its debts. You can’t sue the shareholders for wrongful actions by their company. That is a cornerstone of American capitalism. It is also a principal source of corporate irresponsibility. What we need now is a ferocious counterattack against these corporate owners—a campaign that demands they surrender these special privileges the government has given them. Why protect shareholders from blame when they claim the same constitutional rights—free speech, freedom of religion—that people possess? Human beings are held responsible for their debts, they go to prison for their crimes. Perhaps the owners of corporations should be made to take responsibility for theirs. A similar contradiction is embedded in the Roberts Court decisions that have effectively destroyed the laws on campaign finance. The billionaires and their mammoth companies, banks and investment houses have been granted unlimited power to influence elections or, as we might say, buy the candidates. The Supreme Court has unilaterally unhinged the standard meaning of elections. Elections are no longer collective decisions among citizens choosing their governors. They have become bidding wars among fat cats and powerful economic interests, choosing representatives for the rest of us and thereby choosing our laws. Meanwhile, angry citizens do not need to wait on reform. They should get out their pitchforks and spread the message to those corporate lawyers who are corrupting democracy and to those cloistered right-wing justices who have such great solicitude for the privileged minority.